The MobileMapper® 50 is a new generation GIS data collector running on Android which offers state of the art smartphone capabilities combined with rugged professional quality and improved GNSS performance. 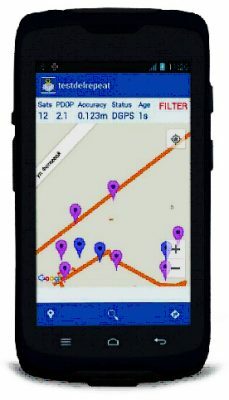 MobileMapper 50 is very compact, lightweight and unique in being a professional grade data collector in a consumer smartphone form factor. This receiver is slim, highly rugged and very powerful (1.2 GHz quad core processor, 16GB memory and 5.3″ display) and also offers GNSS accurate positioning (GPS + GLO or GPS + BeiDou) as well as post processing. MobileMapper 50 is designed for professional data collection and all-day use in the field. It features replaceable battery options (3100mAh or 4800mAh), allowing for all-day operation. It is completely rugged, IP67, to protect against water and dust penetrating the unit, with covered ports (USB, headset, external antenna) to avoid collecting dirt, and are drop-tested to 1.2 m (4 ft). Professionals benefit from use of android OS as it is provides integration with Google applications and easy access to hundreds of thousands of applications via Google Play, the ability to perform multitasking. The Ease of Notification, with missed calls, SMS, or email, there will be a notification on the Home Screen. And finally, the availability of so called “Widgets” on the home screen, that allow for quick information at a glance or easy access to a variety of settings and specifically for our geospatial business the possibility to use Google Maps. Professional field users are strongly influenced by the consumer space and yet, at the same time, need to maximize operational efficiencies. With the MobileMapper 50 both requirements are addressed through full connectivity (depending on the version), superior accuracy, large memory and display all in a slim and compact design.